It looks like rebound from upper levels may result in reverse. I’ve already moved stop on my sell order opened earlier into the black. Later, I’m planning to open several more orders. As we can see at H1 chart, pair rebounded from level of 61.8% right inside one of temporary fibo-zones; price has already broken local minimum and continued moving downwards. If pair is able to stay below 1.35, market will start new descending trend. Franc rebounded from level of 61.8% twice, which also may result in reverse made by bulls. I’ve got only one buy order so far and stop is already in the black. Later, price is expected to move towards 0.92 and higher. 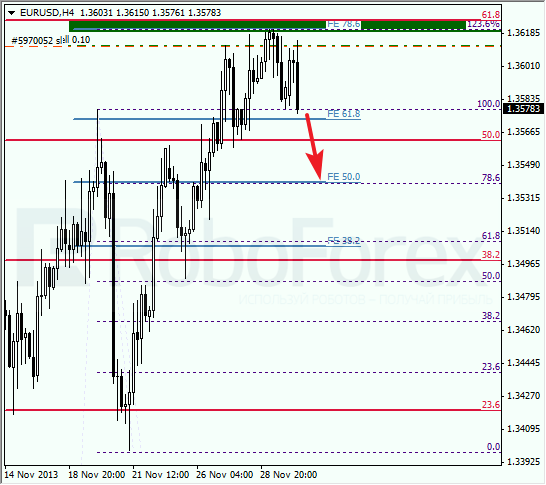 At H1 chart, temporary fibo-zones indicated exact point where price made reverse. Probably, pair may reach several new maximums during the day. In the future, I’m planning to increase my long position during correction.